You’re probably one of the many people who have experienced the horrors of insomnia : the stifling duvet, the clammy skin, the tossing and turning and the unbearable feeling that there’s nothing you can do about it. That you’ll never get to sleep … Perhaps you’re even one of the 20%-40% of the population for whom sleep has become a living hell. Whichever it is, you’re obsessed with finding a way to get to sleep quickly. But what if we told you that there’s a natural and effective treatment that’s largely overlooked by insomniacs? Throughout the ages, people of all social and cultural backgrounds have experienced sleep issues. Yet in today’s society, we seem to have a particular problem with insufficient sleep. So what exactly are the psychological and physiological effects of a chronic, long-term lack of sleep? What purpose does sleep serve? Incredible though it may seem, we still don’t have complete answers to these questions. We know that sleep enables us to consolidate what we’ve learnt during the day, and that it is associated with tissue restoration, growth and mental rest 1. We also know it has a profound effect on the body: blood test results and cognitive scores of young men aged 20 who had had just four hours sleep a night for six nights were found to be similar to those of 60 year-old diabetics (memory loss, hypertension, lower insulin secretion)2. Should we, however, be concerned about the odd bad night’s sleep? 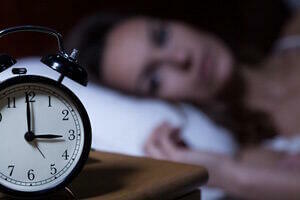 What exactly are the different sleep disorders? And how can we address them naturally? Before we discuss the various problems people have with sleep, let’s take a look at the process itself. Sleep is a periodic state characterised by a suspension of consciousness. It is governed by three regulatory processes: circadian rhythms (controlled by the biological clock), ultradian rhythms (which regulate alternating sleep phases) and the homeostatic process (the progressive build-up of sleep pressure during wakefulness)1. It has been observed that circadian rhythms are not the same in everybody. Some people have a strong preference for going to sleep later than others. In other words, they may be ‘owls’ while others are ‘larks’. In today’s society, owls or night people may find themselves almost permanently sleep-deprived even though they are less prone to sleepiness than morning people. This is entirely logical: ‘night people’ are constantly struggling to adapt to normal working hours with which they are not naturally ‘in synch’. -	Interrupted sleep . Waking up several times a night often makes you feel as if you’ve not had a wink of sleep. Almost 30% of over-65s experience interrupted sleep 2. As we get older, there is a decline in our body clock mechanisms, increasing night wakefulness (to between 7 and 21 episodes a night, according to the scientific literature2). -	Early-morning waking. Waking up too early is a common problem, particularly among those over 60, the reason being an ageing body clock. For under-60s, it may be linked to depression. -	Sleep-onset insomnia. This imbalance is characterised by difficulties in falling asleep – where it can take at least 30 minutes longer than normal. -	Circadian rhythm problems. These affect individuals whose internal body clocks are completely out of control. Although they naturally fall asleep very late (often after 2am), their working hours oblige them to go to bed early. This often leads to immense difficulty in getting to sleep and anguished nights. Regularly going to bed after 2am results in sleep deprivation and serious disruption to biorhythms. Stress is one of the main causes of insomnia: it can keep you awake all night. Even when the source of the stress diminishes, the fear of not sleeping can take over, creating a vicious circle that’s hard to get out of. The longer it goes on, the more difficult it becomes. It’s therefore important to act swiftly and decisively. Unfortunately, most insomniacs are desperate to get rid of the problem at all costs and choose to take sleeping pills (also known as hypnotics). They ignore the fact that there’s a heavy price to pay: autonomy. Scientists have shown that 89% of people who start taking a benzodiazepine or other hypnotic continue to do so for at least eight years 1. And with good reason: as well as significantly changing the architecture of sleep, hypnotics also cause genuine dependency. So forget this ‘false remedy’ and start by improving your lifestyle (make sure you’re physically active during the day, go to bed at regular times, and avoid stimulants such as alcohol and tobacco before bed…)'4, 5. For insomniacs, the pleasure that sleep brings is just a memory: for them, it has become nothing more than a relentless, biological function which must be accomplished for fear of dire consequences. Others are anxious about the loss of consciousness sleep induces. Either way, there is no longer any pleasure to be gained from going to bed. Yet this is a basic requirement for sleeping well. Therefore, steps need to be taken to foster the feeling of pleasure that comes from going to bed – for example, listening to soothing or New Age music 6-8, or doing breathing or relaxation exercises before going to sleep. Relaxation allows you to clear your mind of all thoughts. It also prevents you from actively seeking sleep – it will come naturally when you are completely relaxed physically and mentally. Try this exercise to see the effects for yourself. Lie down on your bed in a comfortable position then repeat the words “My right arm is completely heavy”, imagining your arm is made of lead. Breathe deeply, concentrate hard and say the words calmly but with conviction. It’s guaranteed to work. So you can’t get to sleep – what do you do? You turn over again and again but you just can’t get to sleep. You’re inwardly ranting, believing that without sleep, the next day will be a write-off. The period immediately before falling asleep is the most receptive to positive or negative messages. So stop thinking anxious thoughts and tell yourself that it doesn’t matter how much ‘sleep time’ is left: it will be sufficient to ensure you wake up fresh in the morning, ready to face whatever the day brings. This kind of affirmation is a well-known technique called ‘self-fulfilling prophesy’. If the minutes continue to tick by, get out of bed and engage in a calm activity - and above all, don’t over-dramatise the problem. While the effects on health of a chronic lack of sleep are considerable, this is not the case when it’s just one or two bad nights. Insomniacs tend to exaggerate the consequences of insufficient sleep, which only serves to overplay the situation and exacerbate the problem. If you’re over 50, you also need to accept that your sleep is never going to be the same as before: the erosion of regulatory mechanisms results in frequent wakefulness, and the restorative quality of your sleep will never be what it once was2 . This is probably due to the loss of a phase of sleep. Another myth is that sleeping in till late morning makes up for a lack of sleep in the night. This misconception ends up becoming a ‘rule’ which generates stress and sleep problems. Finally, ask yourself if your tiredness is genuinely linked to your sleep patterns. We often say we’re tired but this word can mask a whole host of symptoms which are not necessarily connected with sleep. A 2004 survey of adults presenting with fatigue found a third had major depression 2. If, after trying everything, your sleep problems persist, there is a natural, proven treatment which you will almost certainly have heard of: melatonin. Melatonin is a neuromediator which controls the body’s internal clock. Production of melatonin by the pineal gland (sometimes called the third eye) depends on light levels, and normally starts as the light begins to fade around 8pm. Its role is to provide the brain with information on circadian rhythms in order to coordinate the body’s internal temperature, motor activity and mood with the particular time of day. It is vital for achieving uninterrupted, restorative sleep. Unfortunately, artificial light, irregular sleep patterns and blue light emitted from smartphones or laptops 9 all impair melatonin secretion. To readjust the melatonin cycle, researchers suggested administering melatonin at certain key periods during the day. Studies indeed confirmed that oral supplementation with melatonin (at doses of between 0.3mg and 2mg a day) for four weeks reduced the time it took to fall asleep in those who were ‘out of synch’ 10-13. It’s no coincidence that the same dose also increased vitality and improved mental health14, 15! Research has also shown that taking such doses for at least six months – and probably more - is completely safe 16. New melatonin supplements have recently become available in which melatonin is combined with CBD, a natural cannabinoid which is attracting unprecedented interest among the scientific community. Combining them in this way is highly beneficial as the CBD perfectly complements the action of melatonin: one addresses the hormonal disruption caused by environmental factors, while the other focuses more on eliminating anxiety and stress, both of which are recognised factors in insomnia. In general, one capsule of CBD + Melatonin taken half an hour before bed is enough to produce positive effects. Phototherapy also readjusts the melatonin cycle by increasing its antagonist, dopamine. The principle is simple: in the morning (between 7am and 9am) you expose yourself to white light, at a distance of less than 80cm, for at least half an hour. Studies have demonstrated astonishing results: within two to five days, restorative sleep was re-established in 80% of ‘out of synch’ individuals 17. These two treatments are generally accompanied by recommendations based on chrononutrition. In the evening, it is advisable to eat foods rich in tryptophan18, 19 (a melatonin precursor): avocados, bananas, chocolate, nuts and grapefruit, for example. Why do you think people used to recommend consuming a cup of hot milk with a few biscuits before bed? It’s because milk is very rich in tryptophan which is optimally absorbed when consumed with carbohydrates (the biscuits!). All the efficacy of prolonged-release melatonin in a convenient, metered-dose, sublingual spray.